Despite all the traumas, violence and setbacks which marked its progress, the story of the American civil rights movement is an uplifting one. It is the story of one of America's greatest revolutions. In the popular imagination, it is often seen as little more than a series of set-piece protests against Southern segregation, led by a charismatic minister, Martin Luther King - protests that eventually moved the conscience of a nation and inevitably climaxed in victory. But it was much more than that, and its roots stretch back to World War Two and beyond - back to the fight against slavery and the aftermath of emancipation. In the meantime, the movement has generated a vast and rich scholarship from historical researchers not just in America but all round the world. 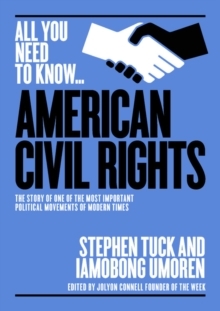 Stephen Tuck and Imaobong Umoren tell the story of US civil rights, from its origins to the present day, and explain what it was like to be black in the American South in the 1950s, when all areas of life were segregated, with black Americans having to attend vastly inferior schools, being restricted to the back of public transport, and not being allowed to eat at department store lunch counters at all. Birmingham, Alabama's notorious Commissioner of Public Safety, Eugene "Bull" Connor, once vowed: "I may not be able to preserve segregation, but I'll die trying.". But despite the progress since then the civil rights debate remains at the forefront of American life. As Barack Obama, America's first African American president, observed at the dedication of a memorial to Martin Luther King in 2011, "our work, Dr. King's work, is not yet complete".